Over three days, participants at the tenth annual International Congress on Sustainable Transport (“X Congreso”) explored what it will take to reinvent cities for better quality of life. Photo by Benoit Colin/EMBARQ. On Monday, we posed the central question driving discussion at this week’s tenth annual International Congress on Sustainable Transport (“X Congreso”) to our TheCityFix readers: how can we make cities better places to live? At the end of the three-day conference organized by EMBARQ Mexico, we’ve heard numerous answers to this question from transport and urban planning professionals, government officials, civil society actors, and business leaders. Some of these address how to best govern our cities, while others look to harness the transformative power of engaged, innovative citizens to catalyze grassroots change. No matter the approach, X Congreso reinforced that there is indeed optimism for the urban future, even amidst challenges to sustainably accommodating rapid urbanization. To carry forward this spirit of optimism, the following are six quotes from the past week that we at TheCityFix hope will stick with you and inspire you to go out and make your city a better place to live. Shared-mobility entrepreneur Robin Chase opened the conference with a keynote address on transforming urban mobility through innovative leadership. Her remarks remind us just how much mobility shapes our everyday lives and determines quality of life in cities. There are very few things that the world’s billions of urban residents all have in common, but the desire to move freely and safely throughout our cities is one of them. 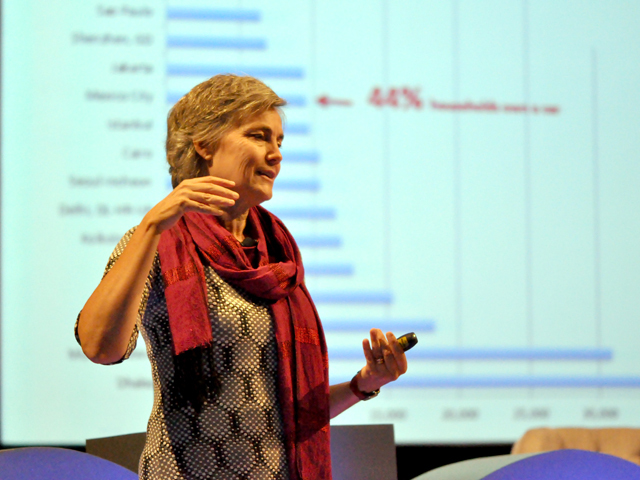 Innovator and entrepreneur Robin Chase delivers the opening keynote at X Congreso. Photo by Taís Policanti/EMBARQ Mexico. Many of the discussions at X Congreso revolved around building cities that move people – not cars – through fostering active transport. Addressing attendees on Tuesday, Guillermo Peñalosa reminded us that this goal brings benefits beyond mobility, and is actually a fundamental piece of inclusive urban development. Car-centric urban design limits mobility for all, and has a disproportionate affect on disadvantaged members of society. For instance, elderly city dwellers can account for up to 45% of pedestrian fatalities and up to 70% of cyclist fatalities globally. Reversing this trend and better protecting the most vulnerable road users is a way to both expand urban mobility and address inequality in cities. 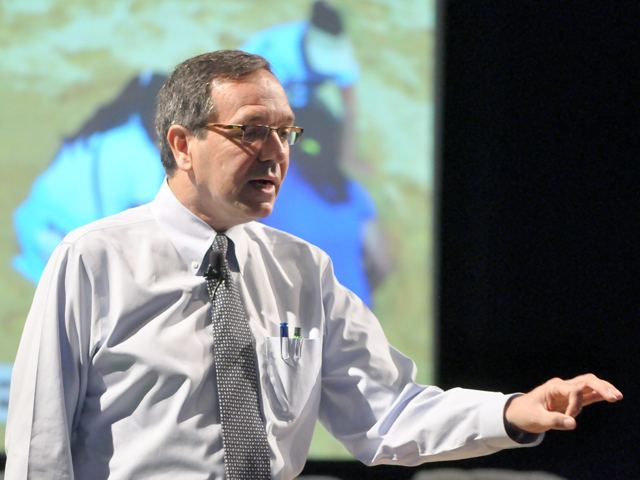 Guillermo ‘Gil’ Peñalosa emphasized the importance of safe cycling and walking for equitable cities. Photo by Taís Policanti/EMBARQ Mexico. Andrew Steer closed proceedings at X Congreso by emphasizing a turning point for the world’s cities. Urban growth in the developing world means cities – especially those in Asia and Africa – are poised to make enormous investments in urban infrastructure in the coming years. In China, for instance, 60% of all buildings will be new buildings by 2050. Because urban infrastructure typically lasts for decades, the decisions these city leaders make today will determine the course that our cities follow for generations. Will we create sprawling, fragmented cities reliant on cars, or connected, coordinated cities that improve quality of life? 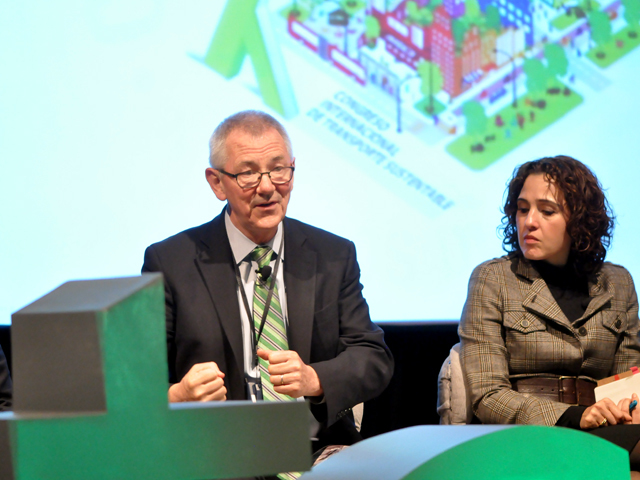 Andrew Steer (left) closed X Congreso with a challenge to city leaders to embrace a new era in sustainable urban development practices. Photo by Taís Policanti/EMBARQ Mexico. 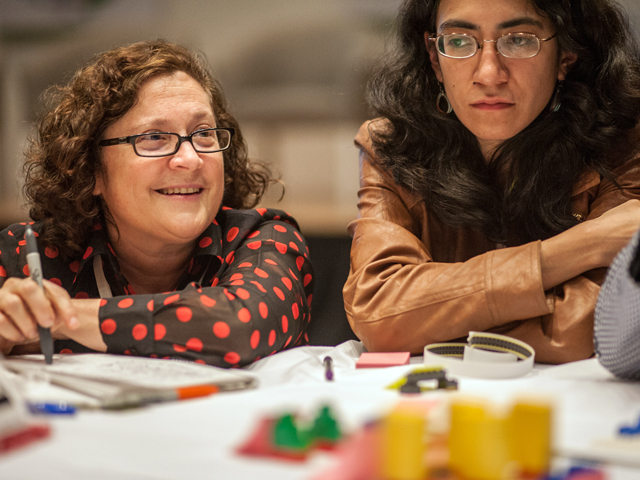 Robin King (left) leads the “Build Your Own City” workshop at X Congreso. 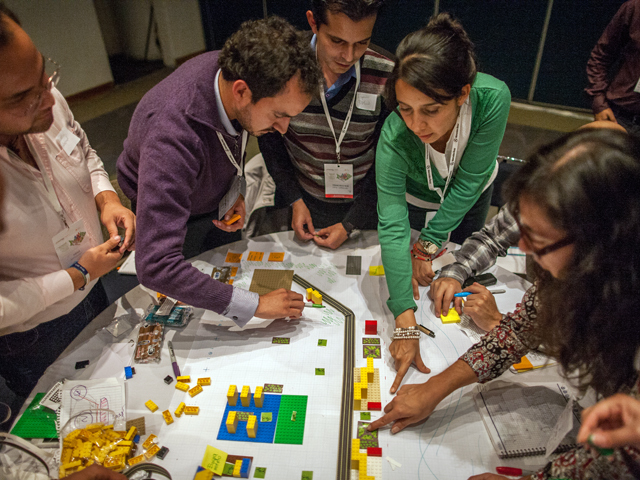 See the cities that participants built during King’s workshop here. Photo by Benoit Colin/EMBARQ. If there was ever doubt about the urgent need to coalesce around environmental action, Francisco Barnés eliminated it here. On top of that, he underscored the importance of coordinated governance to address issues like climate change, ensuring sustainable mobility in metropolitan regions, and fostering cooperation between connected regional economies. Most of all, Barnés reminded us of the high cost of inaction on environmental issues: human well-being. 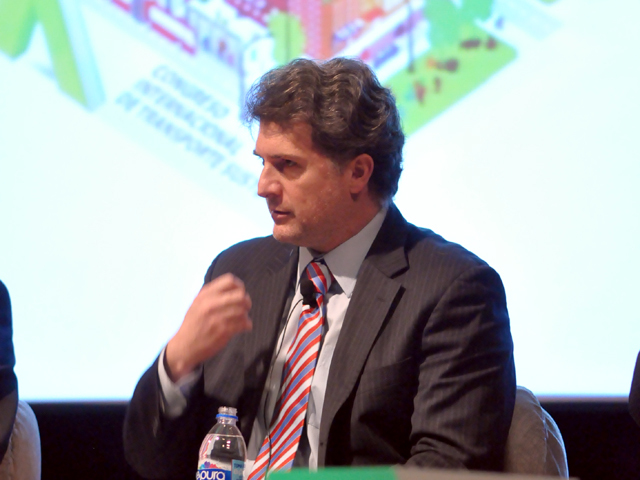 Francisco Barnés Rogueiro spoke about the need to think about urban development at the scale of the megalopolis. Photo by Taís Policanti/EMBARQ Mexico. In the long and difficult journey to create more sustainable societies, it’s easy to focus on all of the problems in our cities today. Robin Chase reminds us that we can’t forget to celebrate our progress and appreciate innovations that makes cities more sustainable. To close out her opening remarks, she recounted a story from her days as CEO of car-sharing pioneer Zipcar, in which the company received an anonymous email simply stating, “Have I told you lately that I love you?” This one moment reinforced in her the reason urban activists and city leaders fight the uphill battle every day to build more sustainable communities: it makes people’s lives better! Here’s to continuing to reinvent our cities despite the challenges, and celebrating the part that each of us plays in creating sustainable cities with a high quality of life for all.